Announcement Handmade Ceramic Focal Beads and Jewelry - I hand shape and form each of these handmade ceramic beads, creating a one of a kind focal piece. I love to create one of a kind pieces that nobody else has. It is my greatest joy to see someone wearing something that I've created. Handmade Ceramic Focal Beads and Jewelry - I hand shape and form each of these handmade ceramic beads, creating a one of a kind focal piece. 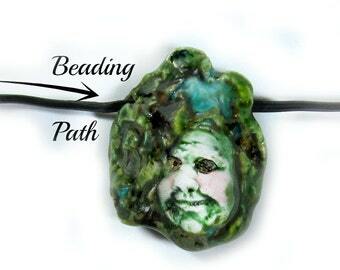 Beautiful, intricate bead! I love the free-handed design and the way the face is almost hidden. So happy to have found your work! The love of getting your hands dirty and just going for it. ?? What will be born and rise out of the ashes. I am a self taught artist who works in Clay, cement,watercolors,oils and sewing. I love to create one of a kind pieces that nobody else has. It is my greatest joy to see someone wearing/ using my pieces. It makes it all worth while! I am a self taught artist who only sells on etsy. I love to create one of a kind pieces that nobody else has. It is my greatest joy to see someone wearing my pieces. It makes it all worth while! I just opened my Home Edition Etsy shop at www.firedupladieshome.etsy.com.